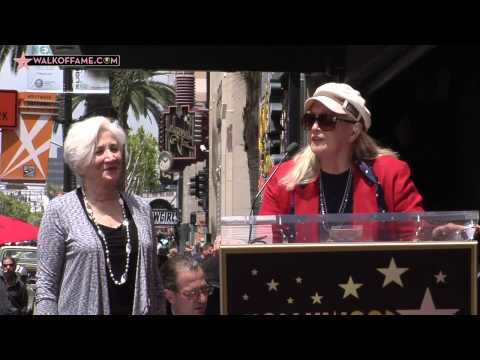 Watch Olympia Dukakis complete star ceremony at the end of this page. Long a vital, respected actor of the classic and contemporary stage and the epitome of Mediterranean-styled weariness, this grand lady did not become a household name and sought-after film actress until age 56 when she turned in an Oscar®-winning performance asCher's sardonic mother in the romantic comedyMoonstruck(1987). Since then movie and TV fans have discovered an acting treasure. Her adaptability to various ethnicities such as Greek, Italian, Jewish, Eastern European, as well her chameleon-like versatility in everything from cutting-edge comedy to stark tragedy, has kept her in high demand for the past 30 years as of one of Hollywood's topnotch character players. Olympia Dukakis was born on June 20, 1931, in Lowell, Massachusetts, the daughter of Greek immigrants Constantine and Alexandra Dukakis. She majored, in physical therapy at Boston University, where she graduated with a BA. She later returned to her alma mater and entered the graduate program in performing arts and earned a Master of Fine Arts degree. Dukakis married Yugoslav-American actorLouis Zorichin 1962. The New York-based couple went on to co-found the Whole Theatre Company in Montclair, New Jersey, and ran the company for 19 years from 1971 to 1990. As an actress, director, producer and teacher, she still found the time to raise their three young children. She also became a master instructor at New York University for 14 years. She scored theater triumphs in "A Man’s a Man," for which she won an Off-BroadwayObie Awardin 1962; several productions of "The Cherry Orchard" and "Mother Courage;" "Six Characters in Search of an Author;" "The Rose Tattoo;" "The Seagull;" "The Marriage of Bette and Boo" (another ObieAward); and, more notably, her many performances as the title role in "Hecuba." A good portion of her success was launched within the walls of her own theater company, which encouraged the birth of new and untried plays. Her prolific directing credits include many of the classics: "Orpheus Descending," "The House of Bernarda Alba," "Uncle Vanya" and "A Touch of the Poet," as well as the more contemporary "One Flew Over the Cuckoo's Nest" and "Kennedy's Children". She also adapted such plays as "Mother Courage" and "The Trojan Women" for the theater company. Over the duration of their marriage, she and her husband have experienced shared successes, appearing together in "Long Day's Journey Into Night," "Camino Real, "The Three Sisters" and "The Seagull," among many others. Both are master interpreters of Chekhovian plays, and one of their more recent acting collaborations was in "The Chekhov Cycle" in 2003. Making an inauspicious debut in a bit role as a mental patient in Lilith (1964), Dukakis tended to gravitate toward off-the-wall films with various offshoots of the ethnic mother. She played mom to such leads as Dustin Hoffman in John and Mary (1969), Joseph Bologna in the cult comedy Made for Each Other (1971) and Ray Sharkey in The Idolmaker (1980). Interestingly, it was her scene-stealing work on Broadway in the comedy "Social Security" (1986) that caught director Norman Jewison’s eye and earned her the Moonstruck (1987) movie role. The Academy Award win for Best Supporting Actress was the last of a stream of awards she earned for that part, including the American Comedy Award, Los Angeles Film Critics Award and Golden Globe Award. From then on, silver-haired Olympia was first in line for a number of roles: Steel Magnolias (1989), Dad (1989), Look Who's Talking (1989), The Cemetery Club (1993), Mr. Holland's Opus (1995) and Mother (1995). Her most recent film, Cloudburst (2011), has been a critical and audience darling, winning her several Best Actress awards and over 40 plus awards for Best Film at various film festivals around the world. On TV, Dukakis received high praise especially for her sympathetic transgendered landlady in the acclaimed miniseries "Tales of the City" (1993) and its sequels “More Tales of the City” (1998) and “Further Tales of the City” (2001). She was additionally seen in episodes of “Bored to Death” (2011-2012),and TV movies “Last of the Blond Bombshells” (2000), “Sinatra”(1992) and “Joan of Arc” (1999). This work is among more than 40 other series, mini-series and guest starring roles she has accumulated over her long career. Dukakis is a strong advocate of women’s rights and environmental causes. Olympia published her best-selling autobiography "Ask Me Again Tomorrow: A Life in Progress" in 2003, an introspective chronicle full of her trademark candor and wry humor. She is also a figure on the lecture circuit covering topics as widespread as life in the theater to feminism, Alzheimer’s, Diabetes and Osteoporosis. She has received the Lifetime Achievement Award from the Greek America Foundation and the National Arts Club Medal of Honor.